Bear Creek Trail, June 29, 2010. 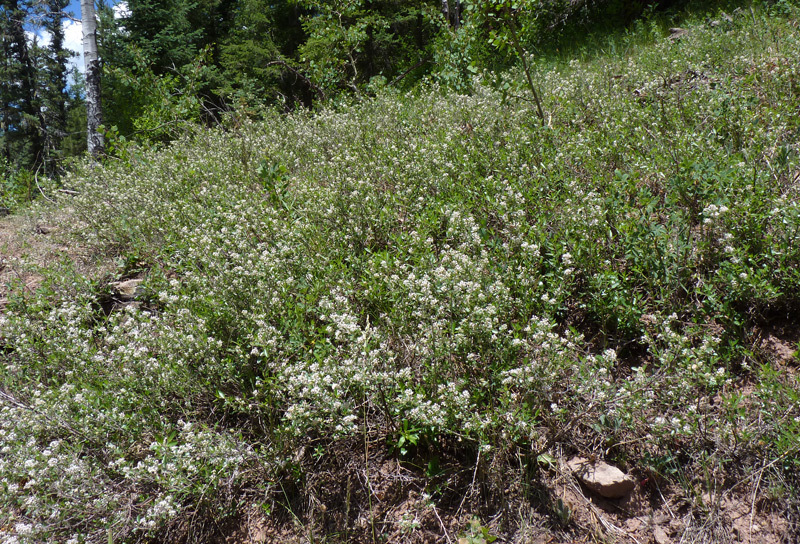 Ceanothus fendleri can spread over hundreds of square feet in open areas, as in the photograph above, but it most often grows in small clumps in forested areas, as shown in the photographs below. 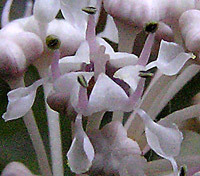 Tiny puffs of flowers in numerous clumps surmount narrow dark green leaves on this low, spreading, somewhat spiny shrub. 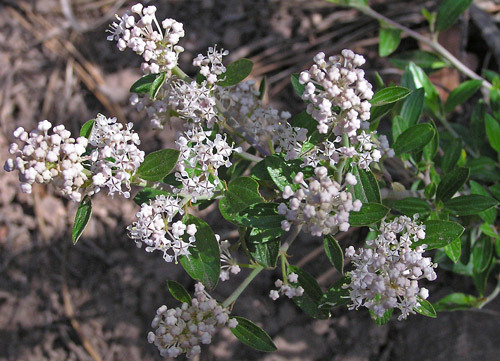 Ceanothus fendleri commonly grows to three feet tall and is almost always wider than tall. 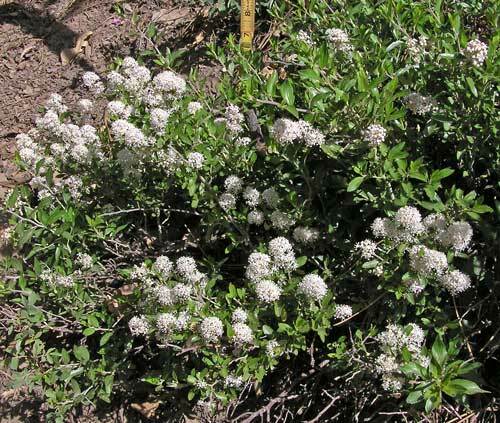 Ceanothus fendleri is fairly common in coniferous montane open woods, and it attracts attention with its numerous bright white flowers. 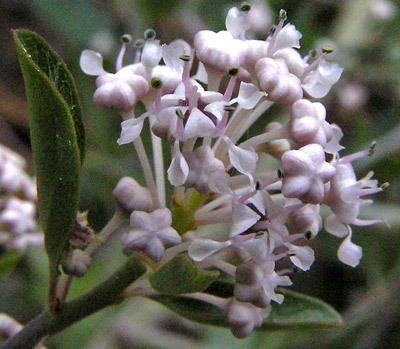 Where you find one shrub, you almost always will find several. 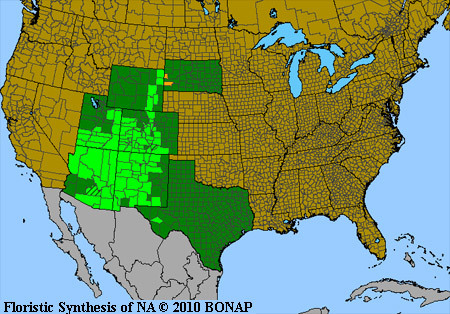 Linnaeus named this genus in 1753 and in 1849 Asa Gray named this species from a specimen collected near Santa Fe, New Mexico by Augustus Fendler in 1847. West Mancos Trail, June 26, 2004 and western San Juan National Forest, June 24, 2013. 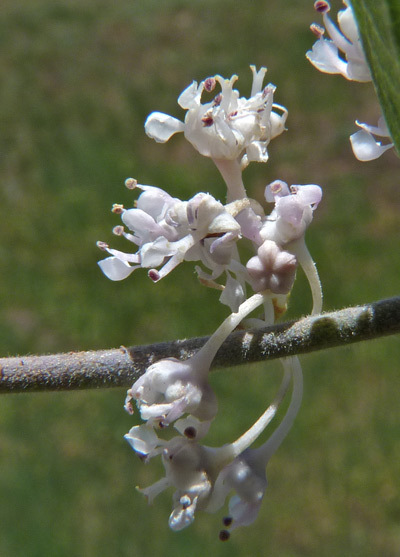 Numerous minute flowers make up the showy clusters. Haviland Lake Trail, June 27, 2005 and western San Juan National Forest, June 24, 2013. Tight star-shaped buds open to exotic flowers. 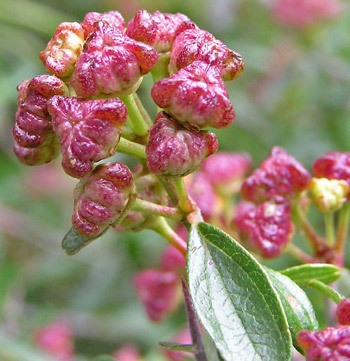 When the star-shaped buds open we see that five triangular-shaped sepals (the bud covers) alternate with five pink stamens (topped with black/green, grooved anthers) and five scoop-shaped petals. Fish Creek Trail, August 9, 2005 and Narraguinnep Natural Area, August 11, 2005. 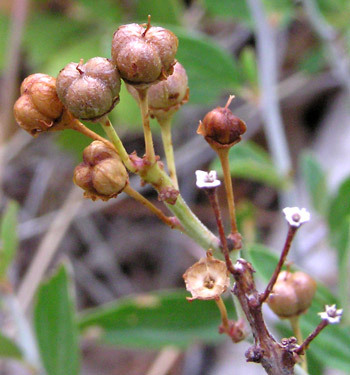 Young Ceanothus fendleri seed capsules are as exotic as its flowers but soon dry and become less eye-catching. 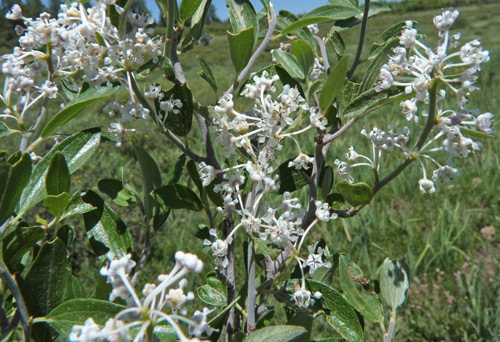 Leaves are typically prominently veined, glabrous on the upper surface, and short-hairy beneath.